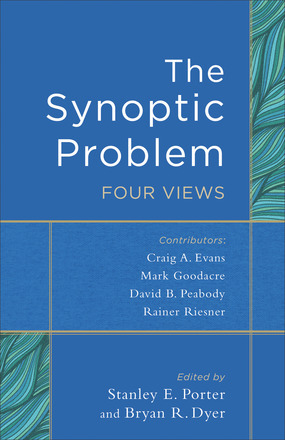 Earlier in the week I checked my campus mailbox and found this treat waiting for me: The Synoptic Problem: Four Views (ed. Stanley E. Porter and Bryan R. Dyer; Baker Academic). I have always been a fan of the “four views” (or “three views”) format. I find them helpful for introducing students to a given subject and useful for helping a professor get a bird’s-eye-view of the salient points for and against a specific view. I was happy to see focused attention given to the Farrer Hypothesis and to Riesner’s “Orality and Memory” Hypothesis. I think this coverage of the topic is particularly useful since: (1) Q skepticism has grown quite a bit in recent years—largely due to the efforts of Mark Goodacre—and needs to be given serious consideration by students of the NT; and (2) research on orality and social memory has significantly impacted our study of the gospels and the historical Jesus in recent years. This book is a welcome addition to the spate of works on the Synoptic Problem. I am planning to use this as one of the primary texts the next time I teach an undergraduate course on the gospels. Is it possible that all the gospel authors were originally basing their account on one and the same protogospel that is not available to us, with each author modifying it based on their own views about Jesus and the audience they serve at different points of time of development of Christian theology? Just a random thought. Sorry, I didn’t complete my thought. So in my take on this, there will be a protogospel about the ministry of Jesus beginning from his baptism at Jordan river until where tomb was found empty and a sayings gospel (like Q source) which includes all his teachings as the two original sources regarding Jesus. Is it far off from what scholars are considering at this moment?